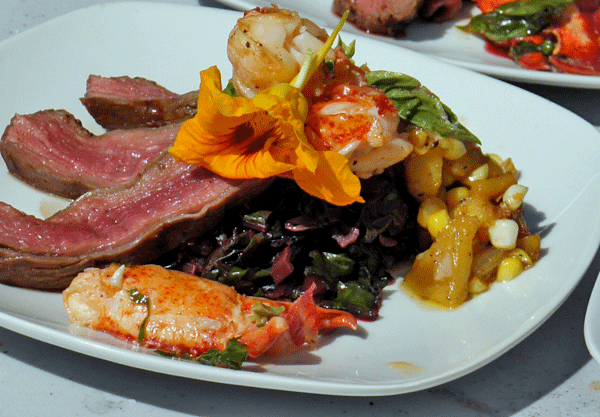 Beautiful and savory plates by Chef Brackmann of G Bar and Kitchen earned the Chef Throwdown trophy. This Sunday will mark the end of the Swampscott Farmers’ Market first season. If you haven’t been this year, you should plan to check it out. In addition to beautiful produce from area farms, they host some terrific locally produced foods. We enjoyed Patty’s Guacamole out of Gloucester, tasty treats from Salem’s Sweet Adeline’s, and lush jams from Marblehead’s Fille de Ferme. Chef Craig Hawley prepares a fresh lobster for the grill. 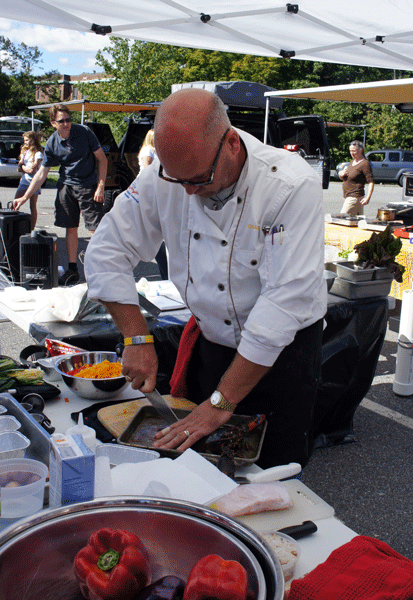 A few weeks ago, I had the honor of being one of the judges at a Chef Throwdown at the market, but due to technical difficulties haven’t been able to post photos until now. It was an awesome event, with all three chefs stepping up to the plate in spectacular fashion, and the crowd hanging on every move. 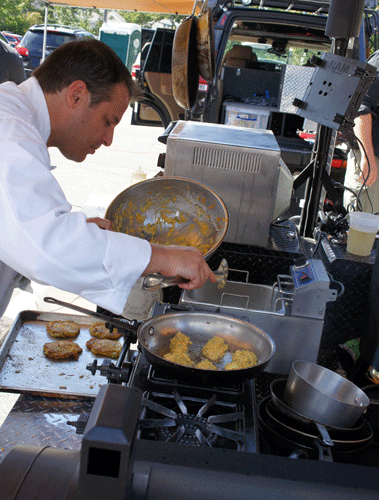 Chef Brackmann whipping up butternut zucchini pancakes. Chef Gregg Brackmann of G Bar and Kitchen may have walked away with the saucepan trophy, but I think the judges were the true winners for the chance to taste some unique and wonderful dishes. Chef Guarino plates his ceviche. Brackmann’s plating was gorgeous, and his accompaniments, like acorn squash and corn hash, red and purple pepper puree, and butternut zucchini pancakes were fresh and funky, highlighting seasonal produce. 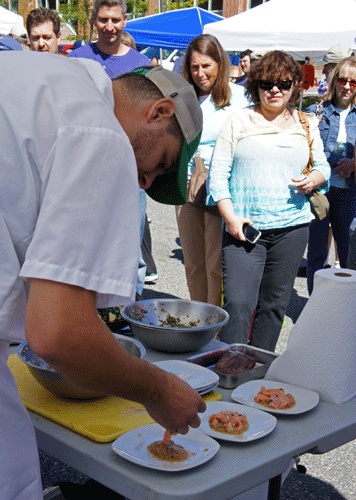 Chef Joe Guarino of Red Rock Bistro wowed the judges with a salmon ceviche that was a taste revelation. 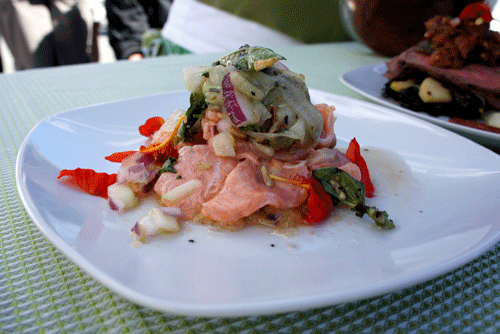 Tangy and tender salmon ceviche by Red Rock Bistro’s Chef Guarino. We loved Chef Craig Hawley’s Bar-B-Que Bistro (seriously, the coolest BBQ truck I’ve ever seen) which he graciously lent to the proceedings, but we loved his smoked purple pepper stuffed with rich seafood etouffé even more. 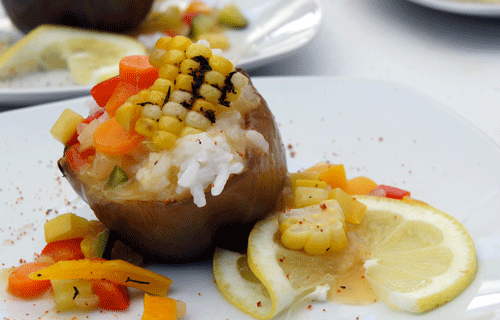 Craig hawley’s divine smoked purple peppers stuffed with seafood etouffe. The Swampscott Farmers Market is a great addition to the local food scene, and we congratulate them on a successful first year and thank them for hosting such a well-organized and entertaining throwdown.